A luxury self catering cottage with garden, ideally situated for exploring the Southern Isles of the Western Isles with the Barra ferry only three miles away. Close to silver sand beaches, lochs and hills. 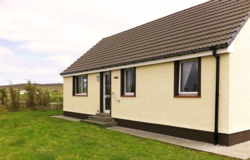 Lingay is a fully-furnished self catering cottage nestled away in the beautiful surrounds of South Uist. Sleeps up to 5 (plus infant) in 3 bedrooms (1 double bed, 2 single beds, 1 pull-down bed) travel cot also Available on request.